gribble (grib'-ul) n. a small marine isopod crustacean (Limnoria lignorum or L. terebrans) that destroys submerged timber. I love our house. We bought it 15 years ago and they've been the best 15 years of my life. We've spent a lot of time during that decade and a half making our house a cool place... this webzine is named after our house which we long ago named Wunderland, in part because it's a place of wonders (and partly as a play on Wunderlich, Kristin's maiden name). But much as we love our house, we've decided that it's time to move. The business we started in our basement has expanded into our living room and beyond... we have boxes stacked up everywhere and employees have desks in every imaginable nook. And our business is still growing. We need more room. But we're not growing that fast... money remains as tight as ever, and we live in an area where rent is anything but cheap. It's not like we can afford to rent office space nearby. Also, that would ruin our wonderful commute. So telling the business to move out and get a place of its own is not an option. We want to get a bigger place where we can all keep living together. 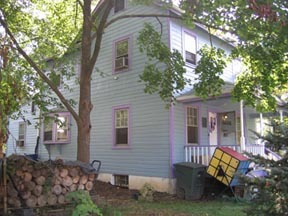 When we bought this house 15 years ago, it was our dream house. For years, we figured we'd never move. But our dreams have expanded, and they now require a bigger canvas. More importantly, we just don't feel safe in this town anymore. Ever since 9/11 we've been worrying that a terrorist with a WMD will strike that big bullseye located just a few miles away. I hate sounding alarmist and paranoid, and we don't like dwelling on this point since we'll be leaving so many friends and family behind, but for this reason if no other, we've decided to move out of the Washington DC area. And after all, friends and family (and inertia) are the only things keeping us here at this point. Time was when we had secure government job tying us to the area, but Kristin's been building our business in such a way as to enable us to run things from just about anywhere. The world is our oyster (whatever that means). We're planning to put most of our belongings into deep storage next spring (it's gonna take at least that long for us to get all our stuff thinned down, packed up, and ready to store). We're planning to spend the summer of 2005 living in an RV, driving around the country, attending as many trade shows and conventions as we can squeeze in, while our realtor works on selling our empty house. A year or so from now, we hope to begin settling down in our new home town. And where will that be? Right now, the top candidate is in Canada: a cool little town just outside of Toronto, called Guelph. We visited Guelph during the summer and were quite charmed by it. That said, until we actually get there, we could always pick another place. The final choice may depend on the events of the next few weeks and months. If Bush wins the election, we'll be going to Canada. If Kerry wins, we might decide to stay in the USA, but that will depend on what the Supreme Court does with the medical marijuana case they just agreed to rule on this term. I've long been saying that marijuana prohibition is unconstitutional, and that one of the ways it could end is for the Supreme Court to strike it down with a ruling akin to the Roe vs. Wade decision, which legalized abortion in 1973. This term, they will finally be considering the question of whether an adult with a doctor's recommendation should be allowed to grow and consume their own medical marijuana, and I just can't see how they can uphold prohibition any longer. Given that nearly 80% of Americans now support the medical use of marijuana, the Justices should feel they have enough public support to make such a ruling, and anyway, the only constitutional leg the drug war has to stand on is the Commerce Clause, which gives Congress the power to regulate the commerce of goods between the states. But when a person grows his or her own marijuana plants and harvests and consumes those plants on their own in their own house, then there's no commerce of any kind involved (let alone state-to-state commerce) and it shouldn't be any of the government's business. How can the Supreme Court possibly rule otherwise? The pundits I've heard making predictions on this case don't think anything will change. A lot of people also think Bush will win the election. I'm an optimist, and I'd like to believe that we're on the brink of major changes in this country. If I'm wrong, we're moving to Canada. If I'm right, Guelph will still be our top contender, but we'd be open to other suggestions for awhile. Either way, next year we're planning to sell our house and move! UberCon is almost upon us! If you'll be in the NYC area during the weekend of October 15-17th, come play in our Little Experiment! At a party over the weekend, I became obsessed with antique Tibetan Singing Bowls. 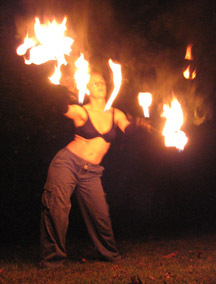 At this same party, people were dancing with fire-tipped gloves, and Alison couldn't resist giving it a try... click on the photo to download a fire-dancing movie! The submission deadline for the 2nd Ice Game Design competition is next week, so if you're working on an entry, get on with the playtesting! "If a 10-kiloton terrorist nuclear weapon explodes beside the New York Stock Exchange or the U.S. Capitol, or in Times Square, as many nuclear experts believe is likely in the next decade, then the next 9/11 commission will write a devastating critique of how we allowed that to happen. As I wrote in my last column, there is a general conviction among many experts - though, in fairness, not all - that nuclear terrorism has a better-than-even chance of occurring in the next 10 years. Such an attack could kill 500,000 people. Yet U.S. politicians have utterly failed to face up to the danger." -- Nicholas D. Kristof, "The Nuclear Shadow"
"The destruction of the twin towers of the World Trade Center was such a horrendous event that it required a strong response. But the President committed a fundamental error in thinking: the fact that the terrorists are manifestly evil does not make whatever counter-actions we take automatically good. What we do to combat terrorism may also be wrong. Recognizing that we may be wrong is the foundation of an open society. President Bush admits no doubt and does not base his decisions on a careful weighing of reality." -- A Personal Message from George Soros: "Why We Must Not Re-elect President Bush"
Lately we've been playing Poker, Texas Hold 'Em style, and this week we tried it using Icehouse pieces instead of poker chips. As usual, scoring with pyramids works great! Smalls are worth $1, Medium are worth $5, and Larges are $25. As you lose, you can watch where your money goes (sort of) by seeing the pyramids of your color stacked up in other players' piles, and when your stash runs out, you go to the Loser's Lounge!